Thanksgiving here in the United States is quickly approaching. I have so much to do, I haven’t even asked my mother or sister if they are coming for dinner yet! Thanksgiving has been at my house for several years now, along with Christmas and Easter. Good thing I like to cook, huh? 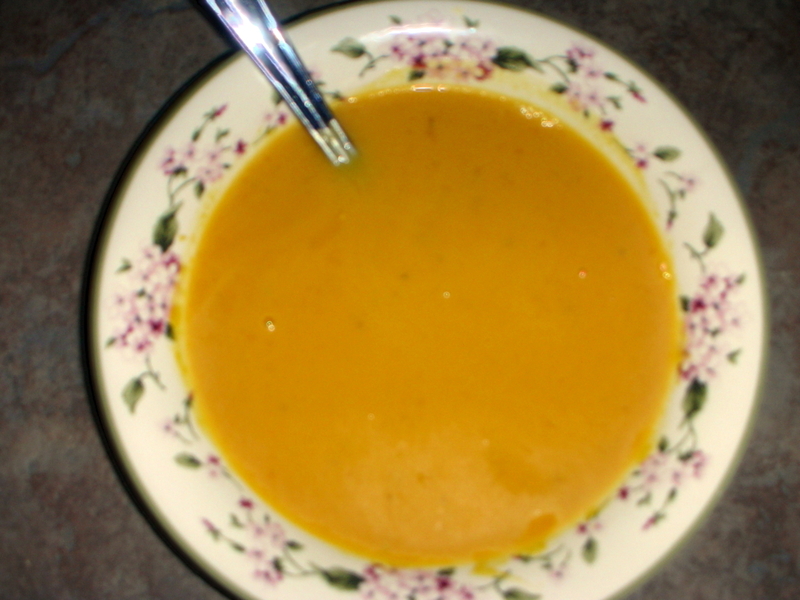 The photo above is of my Pumpkin Soup, which I make every Thanksgiving. Be forwarned, once you start looking at these yummy recipes, you’re not going to want to stop! If you don’t want to look at all of the links right now, at least scroll down to the end and read what my friends sent me. One of my readers said it was the funniest recipe she ever read! The token Thanksgiving thing I make: Broccoli Rice Casserole. 1 bag frozen “baby broccoli” (the little miniature florets, not the big ones you have to cut in two or three pieces to make it bite-sized – that’s like mother nature bullying your taste buds) 1 small jar cheese whiz (my grandmother swore by cheese whiz when she was alive for this recipe only – at all other times, she adhered to the most rigid Old-Southern-Lady cooking standards which have yet to be replicated by mere mortals who are still alive today – now that I think of it, I should try cheese whiz in more of her recipes, as this is the only one to which I’ve ever done justice) One Small onion and one clove garlic (I don’t like onions AT ALL, so I skip this step, and it’s never fazed me – don’t tell my deceased grandmother). 1 can cream of mushroom soup (or cream of celery soup if you are cooking for my husband and his family who categorically refuse to eat mushrooms – it’s like they think mushrooms are onions or something – don’t use celery if you are cooking for my dad, as he thinks celery is onions or something) Brown Rice (I don’t for the life of me remember how much – I just cook a bunch, mix in as much as needed and feed the rest to my husband, who can eat straight rice the day before Thanksgiving and call it dinner) 1. If you are weird and you can eat onion without gagging on its inherent weird tangy, crunchy, overpowering disgustingness, chop up a small onion and a clove of garlic and saute them for 2 minutes, max. 2. While the onion is befouling your kitchen, prepare rice as you normally would (fancy people have rice steamers, I just follow Uncle Ben’s instructions). 3. While these other things are happening, boil some water and cook the broccoli according to package directions. 4. Once all of these things have been prepared, mix them with the soup and cheese. You will probably use all the broccoli, but you might not need all the rice. Feed the leftover rice to your partner/child/rice tolerant pet/easily amused neighbor. 5. Do you have a disgusting looking, delicious tasting cheese/broccoli/rice paste going now? Yes? Excellent (try not to eat ALL the paste – you need to save it for Thanksgiving!) Not-so-much? Keep mixing. It’s coming. 6. Once you have mixed it, transfer it from your mixing bowl to a corning wear dish. I always make a double-order of the stuff the day before Thanksgiving, keep it in the fridge in carefully separated dishes (so as not to contaminate the mushroom soup version and the celery soup version) overnight, and schlep it to far-flung parts of the county adjacent to the one where I live as I hit up multiple Thanksgiving celebrations. Keep it cool and it will keep you in your family’s good graces for a day, but get the first family you visit to commit some fridge space to it in advance so it will still be good for the second round (it helps if your parents and your in-laws are friends – I never realized how dependent my recipe was on this type of privilege until right now). If other things need more or less time/heat, this stuff plays well with others. My in-laws and my parents both regularly stick it in the oven with a range of side dishes that require different times and different temperatures. If you have to adjust your oven temperature, just keep it in the oven until it looks pretty. 7. Once you get to a house where people are eating, bake for 30 minutes at 350 Fahrenheit. Whatever you do, don’t confuse the celery soup casserole with the mushroom soup casserole. I put one in a square pan and the other in a round pan so I can tell the difference. This is pretty much the only thing I make from scratch. I know it, I love it, and I can’t cook anything else. Thanks for including my Mini Apple Pecan Pies. What a great list! Bernadette, thanks so much for including my Skinny Pumpkin cheesecake recipe! Your collection looks great! I hope you have a wonderful Thanksgiving! Wow! Great list. Are you trying to get me to add more to my list? 😉 Thanks for sharing. Thanks for including my Mini Apple Pecan Pies. You have a wonderful round up of Thanksgiving recipes. Bernadette, thanks so much for including my Pumpkin Pie and Veggies in Apricot Sauce in your round-up! This looks great, I can’t wait to go through each one! Pinned and stumbled. Thanks again!